Background: The traditional four incision laparoscopic cholecystectomy is being challenged by new innovative single incision approach. 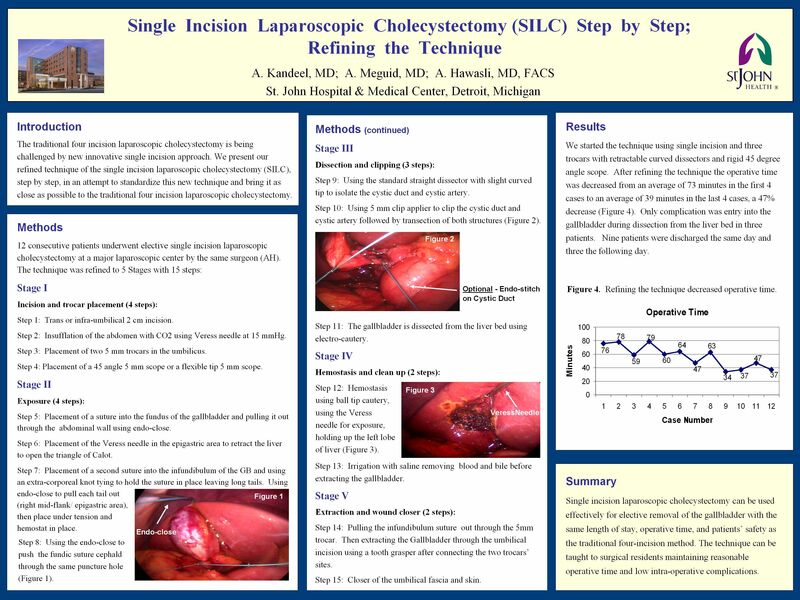 We present our refined technique of the single incision laparoscopic cholecystectomy (SILC), step by step, in an attempt to standardize this new technique and bring it as close as possible to the traditional four incision laparoscopic cholecystectomy. A) Incision and trocar placement (4 steps). B) Exposure (4 steps). C) Dissection & clipping (3 steps) D) Hemostasis & clean up (2 steps). E) Extraction and wound closer (2 steps). Results: We started the technique using single incision and three trocars with retractable curved dissectors & rigid 45 degreeangle scope. After refining the technique the operative timewas decreased from an average of 73 minutes in the first 4 cases to an average of 39 minutes in the last 4 cases, a 47% decrease (Fig.1). the liver bed in three patients. Nine patients were discharged the same day and three the following day. Conclusion: Single incision laparoscopic cholecystectomy can be used effectively for elective removal of the gallbladder with the same length of stay, operative time, and patients’ safety as the traditional four-incision method. The technique can be taught to surgical residents maintaining reasonable operative time and low intra-operative complications.